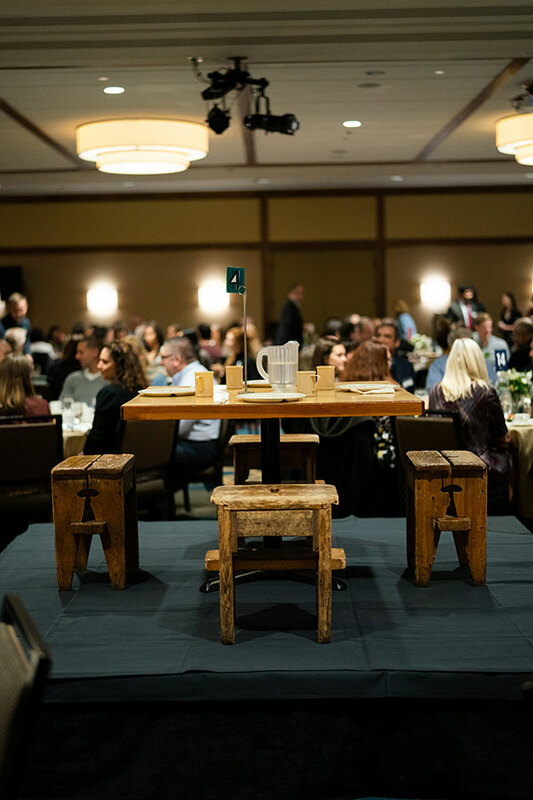 A record $213,000 was raised to fund the work of Blanchet case managers, who work one-on-one with men who are seeking to rebuild their lives after landing on the streets of Portland. Founded in 1952 by University of Portland alumni, Blanchet House serves breakfast, lunch and dinner to anyone in need of a warm meal. Staff also operate two clean and sober transitional housing programs for men wanting to rebuild their lives after addiction, homelessness or job loss. 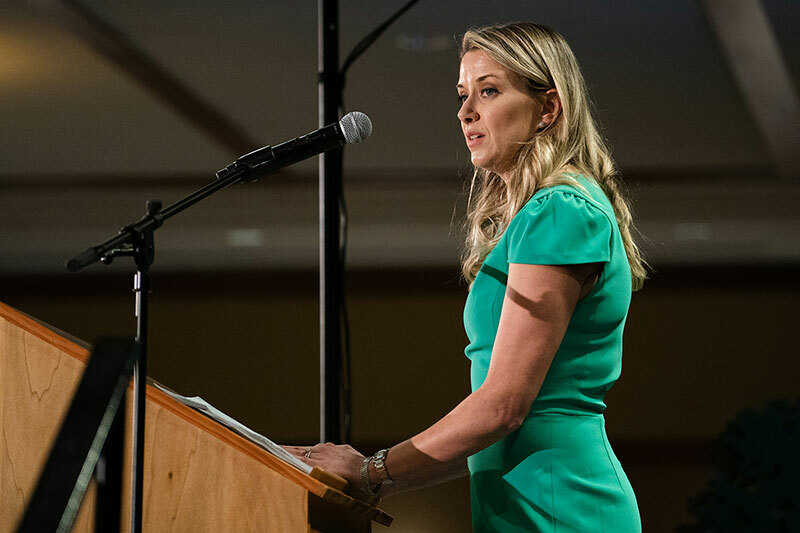 Emily Harrington, Blanchet House’s first female board president, gave a rousing speech about the importance of remembering “who’s not at the table.” An empty table from Blanchet House’s Founders’ Cafe dining room was set in the center of the ballroom as a visual reminder of the people Blanchet House serves. Other speakers included J.D. Linton, a resident of Blanchet House’s transitional housing program, and Kristi Katzke, a case manager. Linton told the story of nearly losing his life to alcoholism and “getting his spark back” at Blanchet House. Linton, who now is employed full-time by Pacific Coast Fruit, presented the company’s owner David Nemarnik with the Al Riley Award for sustaining food donations. Greg Baker, executive director, and philanthropist Scott Duffens presented the Founders’ Award to Fortis Construction for their support and the Father Kennard Award to Janeen McAninch for volunteerism. Jesuit Father Gary Smith delivered the blessing. Multnomah Athletic Club chef Deanne Bascom volunteered her time and talents to prepare the meal. Corporate and individual sponsors funded the event.